Our little Wisemen adventurers have been searching long and hard to find baby Jesus and we are about to finish up the search! If you missed the first few post click here to learn the whole story! Caspar is at it again. He's having fun when there is searching to get done! 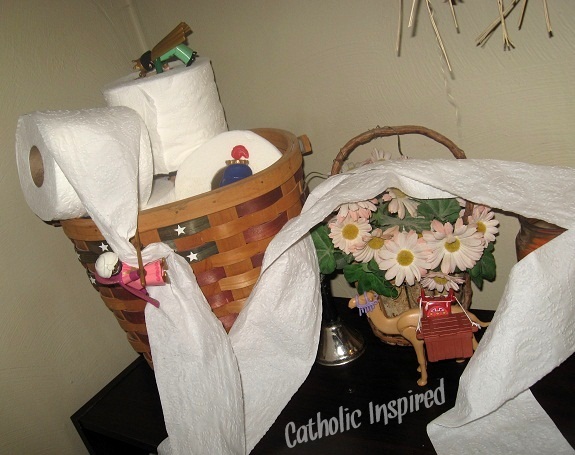 Balthazar and Melchior are working hard to find the infant Jesus in our toilet paper roll basket, but Caspar's silly fun-loving side just made a slide out of the toilet paper! 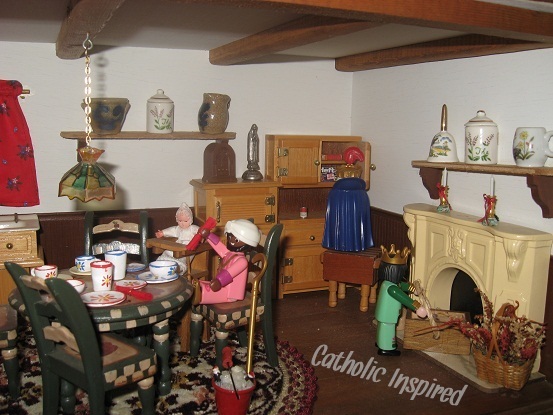 When entering the doll house the Three Kings first had to determine if the baby in the high chair was or was not the Infant King they were looking for! Once they came to the conclusion that the baby was just a regular baby, Balthazar and Melchior began to search the doll house for clues as to where the true Infant King was located. Caspar decided to sit at the table and have a party with his new friend, "baby"! A grand thought occur to them!! Google has all the information in the world! So they hoped over to the computer and began a Google search! 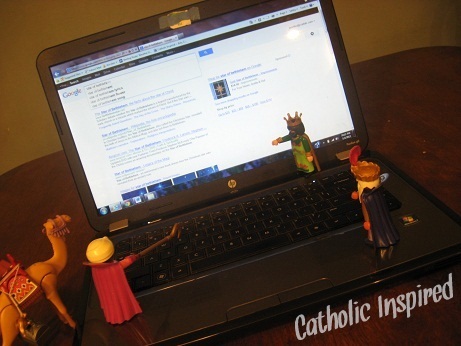 Caspar used his staff to type the letters and Balthazar and Melchior told him what to type! "Where's the new born King?" -A Stable! Who would have thought! Okay, I think they got all the information they need! Maybe they will actually find him tomorrow! Looking for a few Epiphany Crafts and Ideas? January is the month of the Holy Name of Jesus. 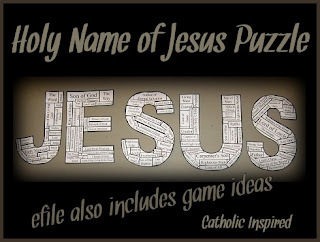 So in honor of The Holy Name of Jesus I want to have a Giveaway of our Holy Name of Jesus E-file! Cute ideas! Thank you, Jennifer and Blessed Epiphany! I found your blog on Pinterest. Looking forward to reading more. 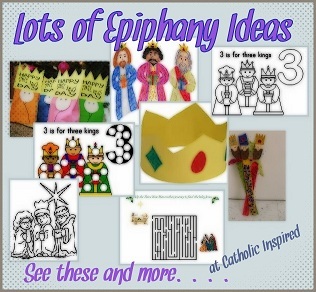 Great ideas for celebrating the Feast of the Epiphany! I'm teaching my students about this tomorrow and I've made them mini bundt king cakes for them to decorate. The idea came from Tiffany. thanks so much for rounding up these lovely ideas. i look forward to working on one project tomorrow after Mass. 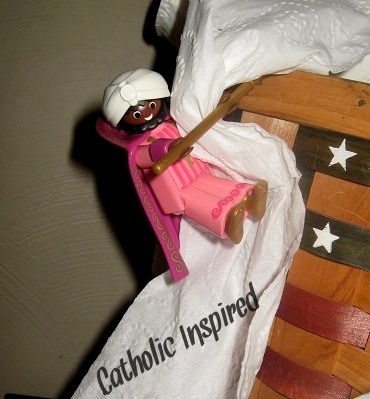 i included your post in my resources for my recent epiphany post. I am a grade one teacher in a Christian school and can't wait to use this in the classroom next year! Thank you for your creativity!! !